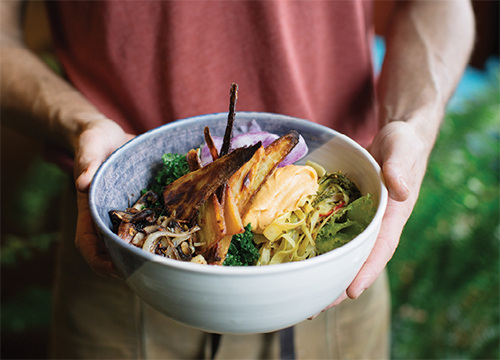 For Caleb Crowell, who owns Kindly Kitchen in Boone with his wife, it was always a question of “What are we supposed to eat to feel healthy each day?” The restaurant serves ultrawholesome, unadulterated vegetarian, gluten-free, dairy-free fare prepared with seasonal ingredients sourced from about 70 area farms. The menu is so fresh that it might change even within the same day. 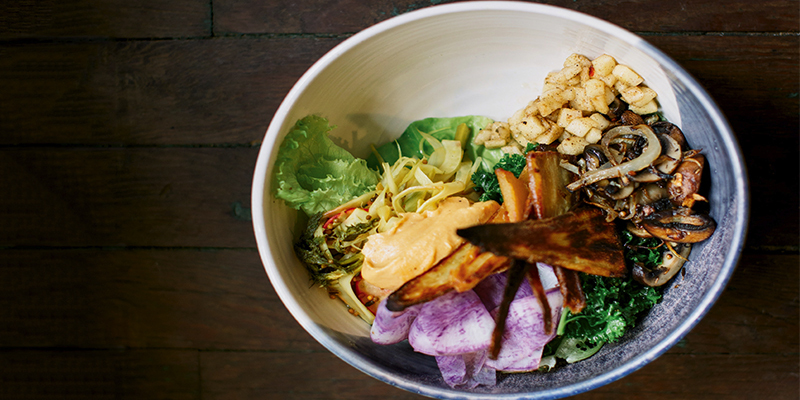 Despite the ever-evolving options, patrons can always count on healthy creations akin to this hearty winter vegetable salad that combines spiced portabella, pickled fennel, masala apples, and crispy parsnips complemented with a tasty butternut toum, Crowell’s take on a Middle Eastern vegan mayonnaise. While the recipe is involved, he assures that each of these ingredients could be made as stand-alone sides. Either way, dinner guests will surely be wowed. Trim portabella by removing 50 percent of the gills and stems, and cut into half-inch strips. In a pan, heat oil over medium-high. Add cumin and cook until slightly toasted and fragrant. Add paprika and cook 10 seconds. Add the onion and garlic and increase heat for one minute, then reduce heat and cook until starting to crisp, six to 10 minutes. Add portabella and a few pinches of salt and stir. Cook until mushrooms begin to release moisture and darken and the liquid is reduced by 80 percent. Turn off heat and squeeze lemon while tossing pan. Season again to taste. Place fennel, pepper, and onion in a heat-proof bowl. Heat oil in a pan. Add peppercorns and cook for one minute, then add mustard seeds and cook for another minute until seeds pop, then turmeric and cook for another minute. Add vinegar, water, salt, and molasses and stir. Heat until steaming, then pour over fennel, peppers, and onion. Let sit in brine for one hour, then place bowl in sink with ice water to cool. Can be made in advance. Store sealed in fridge for up to three weeks. Over medium-high heat, toast garam masala in dry pan until fragrant, one to two minutes, then remove from heat. In a bowl, add apple, oil, vinegar, salt, and masala, and toss to coat. Preheat oven to 350°F. In a pot over high heat, boil two heaping teaspoons of salt in water. Add parsnips, and cook for one minute or until tender. Remove from water with a strainer and place in an ice bath to cool. (Can be done in advance.) Transfer parsnips to a bowl, toss in oil and place on a preheated sheet pan. Cook until crisp, about 15 minutes. In a blender on high speed, blend garlic, lemon juice, and 80 percent of the water until smooth. Add oil very slowly. (If blender pticher starts to feel warm to the touch, add the rest of the ice water to maintain emulsification.) Add roasted butternut squash and blend until incorporated. Texture should be thick and mayonnaise-like. Place in fridge for two hours to firm further. In a bowl, pour oil over chopped greens and massage strongly until they turn dark green. Portion cooked grain and greens into four large bowls. Arrange sliced veggies, tarka portabella, pickled fennel, masala apples, and a dollop of butternut squash toum (find the recipe online). Top with parsnips and parsley. Season with salt and pepper.